Governor Jerry Brown signs the bill placing the water bond, Proposition 1, on the November ballot with Republican and Democratic legislators applauding. 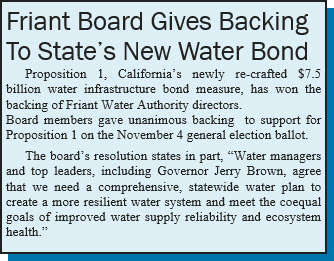 For the second time in five years, an all-out effort by the Friant Water Authority has resulted in legislative approval and a governor’s signature of a comprehensive water infrastructure bond that includes a significant funding mechanism with which to help develop new California surface water storage facilities. A new San Joaquin River reservoir – Temperance Flat – is a leading candidate to share in the bond funds if they are approved. PROPOSITION 1The new water bond plan, designated as Proposition 1 on the November general election ballot, is a reduction from $11.14 billion proposed in the 2009 bond that was signed into law by then-Governor Arnold Schwarzenegger. That measure was twice delayed by the Legislature from going before voters, in 2010 and 2012, largely because of the state’s budget crisis. 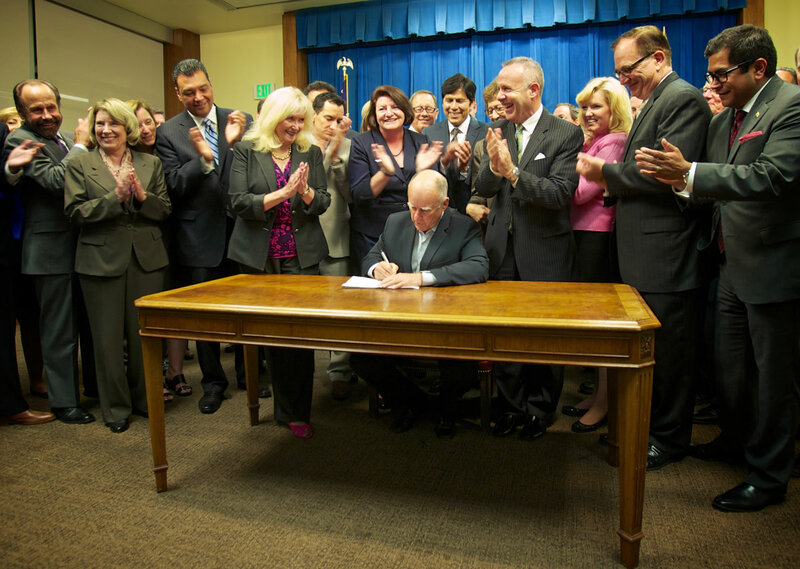 Governor Jerry Brown signed the new bill August 12, shortly after it was approved 77-2 in the Assembly and 37-0 in the Senate. It wasn’t easy. For months legislators had to hack through competing bills with widely differing provisions and intents as well as a big range in proposed bond values. Plus, Brown until fairly recently did his best to steer clear of the bond debate before proposing his own $6 billion measure, containing $2 billion for storage. That helped spark the final intense rounds of legislative negotiations, much of it on a bipartisan basis, that led to final passage. Lawmakers, also spurred toward compromise because of worsening effects of California’s drought, were up against the clock. On August 10, a bill was passed authorizing a two day extension of the deadline for printing voter guides. Brown’s signature came at the reset deadline’s wire. “This bond is a compromise,” said Senator Lois Wolk (D-DAVIS). “No one got everything they wanted. But all of California gets what it needs.” She said the bond’s legislative passage “was a historic moment that demonstrated government, at least here in California, can get things done when partisan politics are set aside.” Jacobsma said the bond proposes funding in a number of areas (please see adjacent listing), including some San Joaquin River Restoration Program elements. He added, however, “No funding for inter-regional conveyance was provided in the bond. The Governor has apparently committed to support funding for that type of conveyance out of appropriations, which may include integrated regional water management funds.” He said Friant would need to consider possible projects. New surface water storage is a key bond component. It would receive 36% of the bond funding if voters were to approve. None of California’s five previous water bonds that passed ballot tests contained surface water storage funding.